Mood Swing, founded in 2004, is one of the several 5C A cappella groups, and performs songs from across the musical spectrum. The group aims to develop strong musical skill and appreciation, while also fostering relationships with one other. Mood Swing is currently made up of singers from Claremont McKenna, Pitzer, and Scripps colleges, and is led by CMC senior Andie Wheatley and Scripps sophomore Stephanie Kim. 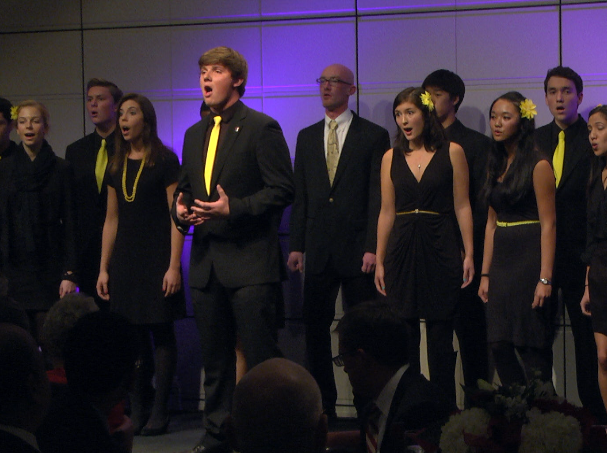 Wheatley, the group’s president, said performing for the Trustees was an incredible experience. "They've given us so much, so it was a great feeling to get to share our work with them,” she said. "CMC's focus is so rarely on the arts, but I'm glad to see the growing interest in fostering our programs. The guests seemed to really enjoy it, and I was really pleased with how it turned out." David Leathers ’15 sang lead on the group’s version of The Morning Comes. “It can be kind of intimidating singing for a room full of billionaires,” Leathers said. Despite the butterflies, he delivered a knock-out performance.